Antibiotics for Gram-negative pathogens are extremely challenging to discover. This is largely attributed to the impermeability of the outer-membrane, coupled with promiscuous efflux pumps. In our recent paper, we experimentally developed a set of guidelines to predict small-molecule accumulation in Gram-negative bacteria. It is well-accepted that there is a need for new classes of antibacterials to combat Gram-negative pathogens. The challenge of discovering antibacterials for Gram-negative species is largely attributed to the impermeability of the outer-membrane, and screening libraries are simply not composed of compounds that can penetrate these cells. This is the reason why screening even very large numbers (500,000) of the types of compounds in standard collections typically returns no tractable hits for Gram-negative bacteria. In 2013 we published a new strategy for compound synthesis, called Complexity-to-Diversity (or CtD) in Nature Chemistry, a means to rapidly generate natural product-like compounds. As a large percentage of antibacterials are natural products and their derivatives, we felt we were in a unique position to design and synthesize a collection of compounds biased for Gram-negative antibacterial discovery. In the initial phase of the project, we sought to bias our collection for Gram-negative antibacterial activity by designing in the physicochemical properties thought to be common features of Gram-negative antibacterials. As a guide, we relied on the retrospective study published in 2008 in the Journal of Medicinal Chemistry by O’Shea and Moser, in which they highlighted low molecular weight and high polarity as common features of antibacterials with Gram-negative activity. Coupling these insights with the general observation that antibacterials are often charged, we synthesized a collection of 100 CtD compounds, including positively charged, negatively charged, and neutral library members. However, from our testing of these compounds for accumulation it rapidly became clear that the information in the retrospective studies could not be used to guide construction of this library, as we found that most low molecular weight and high polarity compounds still did not accumulate in Gram-negative bacteria. Thus began our effort, recently published in Nature, to develop predictive guidelines for small-molecule accumulation in Gram-negative bacteria. Figure 1: Workflow for developing guidelines for predicting compound accumulation in Gram-negative bacteria. We initially synthesized a collection of complex-and-diverse compounds. These compounds were tested for accumulation in E. coli, and the results were analyzed using cheminformatics. We were able to apply the results to convert a natural product only active against Gram-positive bacteria into a broad-spectrum agent. The workflow for our study is shown in Figure 1. In summary, we utilized an LC-MS/MS based assay to test compound accumulation in E. coli, and we tested the 100 compounds mentioned above for accumulation. The data that began to emerge was extremely telling – only 12 of our 100 compounds accumulated in E. coli, and all the accumulators contained an amine. However, not all the amines accumulated, and we wanted to be able to better predict compound accumulation in Gram-negative bacteria. Taking a closer look at the accumulators, we observed that most of them were primary amines. We expanded our set of primary amines to over 60 compounds, tested their ability to accumulate, and performed cheminformatic analyses on the set. We found that compounds most likely to accumulate contain an amine, are relatively rigid, and have low globularity. Gratifying, these guidelines can predict the spectrum of clinically used antibacterials (Figure 2). 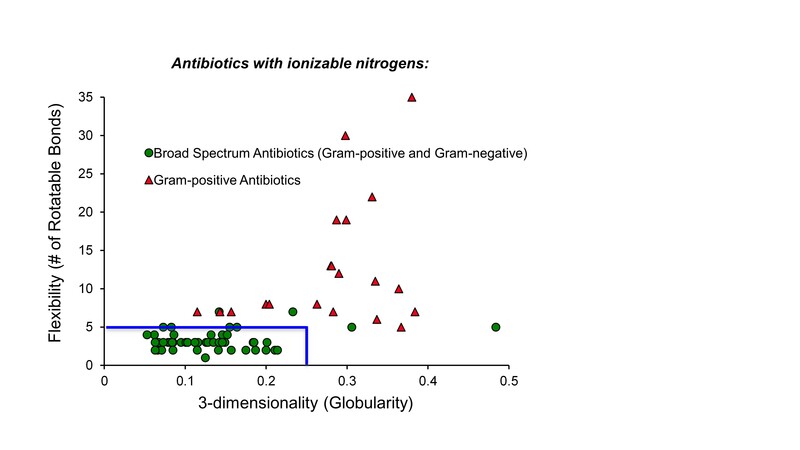 Figure 2: Antibiotics with an ionizable nitrogen are most likely to be active in Gram-negative bacteria if they are rigid and have low globularity. Finally, we applied these studies to convert a natural product with Gram-positive-only antibacterial activity into a broad-spectrum antibiotic. It was exciting to discover that our compound kills MDR New-Delphi β-lactamase producing E. coli. It has always been a bit of a mystery why putting an amine on a Gram-positive-only antibiotic like penicillin leads to a broad-spectrum antibiotic (ampicillin), whereas this strategy does not work for so many other Gram-positive-only drugs (e.g., erythromycin, pleuromutilin). Only through the evaluation of our unique compound collection were we able to discover that three criteria must be met – positive charge, flexibility, globularity – before a compound is able to traverse the Gram-negative membrane and accumulate in these pathogens. Respected,we have to produce compounds directly which will accumulate the membrane of gram - bact rather than converting them + to broad spectrum.For that we have to analyse the reasons that are responsible for not accumulation.basing on that reason we will work means we get results defeatneatly.For this we have go to molecular level in Chem and bio of properties of outer membrane of gram - bact.